VIENNA Advantage > Business Hacks > How to Evaluate a CRM – Customer Relationship Management Software? Investing in the right CRM solution would most probably increase productivity, cut operating costs, boost efficiency and increase revenue. But with so many options available today, a company needs to have clear selection criteria in order to make the right decision and choose the CRM that best suits its business needs. Before you start the whole process, it’s important to understand why your business needs a CRM in the first place? A well planned CRM strategy supported by the right technology can deliver powerful results – but what goals do you want to achieve through CRM? Is it to produce powerful sales and business insights? Is it to have a history of your contacts, leads, deals and conversations? Whatever your goals are, write them down! You will be able to better evaluate your options if you know what your goals are. Annual cost: What is the annual cost of the CRM? First you need to figure out how many people in your company will be using the CRM, then find out the subscription fee per month of the companies you are evaluating. Implementation: How long does the CRM take to implement? Some CRM systems take a lot longer to implement than others. What good is a CRM, if you have to wait for nearly a year, to use it? Be sure to ask your CRM vendor how long they expect implementation to take. And do not forget that your job isn’t done when the CRM is working, it’s done when your team is actually using it. Does it cost anything extra to implement? Some CRM systems cost extra to implement, while some are easy to set up and don’t require any extra implementation costs. For small businesses and start-ups, avoid expensive CRM implementations. You can find great CRM solutions that are free and/or cheap to implement. Mobility: How important is mobility to your team? A CRM that works when you’re sitting at your desk will not necessarily work anywhere, like in the field. Mobility is a key-driver for CRM selection so you can make sure the experience is seamless from desktop to mobile. Look for a system that is easy to access from anywhere, anytime, even offline. Integration: Does it integrate with the tools you already use? Can you attach or create invoices, proposals and sales quotes? What are the key tools or programs you need the CRM to work with? What email marketing tools does the CRM integrate with? Does it offer document storage? Analytics: Does it provide the reports that the management needs? The data that you can glean from a CRM system is only as good as the data entered. Think about what metrics you as the manager, need to see – and make sure the CRM you choose will readily provide you with those insights. Automation: How well does it automate for you? Make sure the CRM system you choose is able to automate certain tasks such as: Call Logging, Task Reminders, Calendar and Alerts, Email Automation, Workflow Automation, etc. Scalability: Will the CRM grow with you? Geo-location: Some modern CRM’s offer geo-location functionality, which allows you to visualize your contacts, leads, and deals on a map and reach them with one-touch driving directions. Cost to Grow: Just because a CRM works for your company today, it doesn’t mean it will be a fit in 1, or 5 years. Think about how a CRM will scale up as your business grows. Look for a CRM that will be a long-term partner. Customizability: Is it easy to customize it to suit your business? Look for a CRM that allows you to easily customize your sales stages and add custom fields, filters and tags, so it makes sense to your business. Data Access: Can you easily import and export your data? Do you need your IT department to import and export data – or can users complete this process themselves? Can you run your current system and the system you’re switching to, in parallel? How well does the company document the import/export process? Customer Support: Will you receive the customer support you need? It’s important to remember that when you’re selecting a CRM, you’re not only selecting a product, you’re selecting a partner. How would you rate your interactions with each company you are evaluating? What is their customer service and support options like after you’re up and running? After filling in the above table and summing up the results, choose the vendor with the highest score! By following this article you will be on the right track to select the best CRM solution for your company. 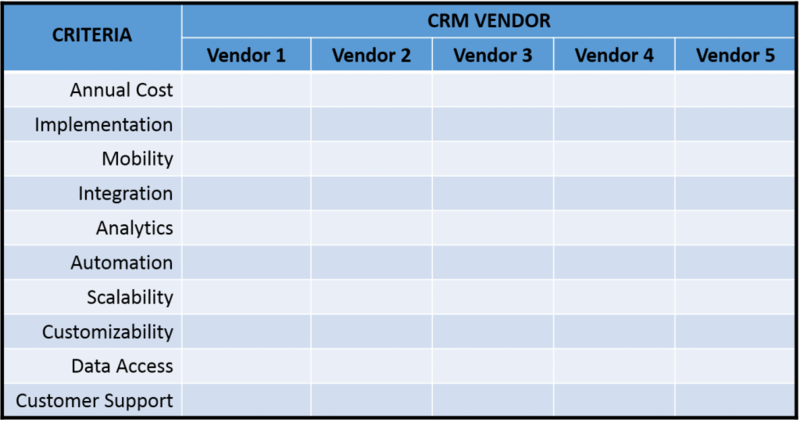 Do not forget to add VIENNA Advantage CRM to your vendors list.